Mongoose’s publication of Adventure 4: Into the Unknown included a version of the Kankurur G-carrier which first appeared way back in 1987 in Grand Census, and again in 1989 in World Builder’s Handbook, as an ideal survey vehicle for scouts who want to get out and about. In Into the Unknown, this g-carrier is presented with Supplement 5-6: The Vehicle Handbook stats. However, the adventure was written before that volume was published and so was initially designed with Supplement 5: Civilian Vehicle stats. Those numbers are given here for those who still use that system, along with the author’s original deck plan (which was replaced by a Mongoose artist’s much more illustrative version in the published book). ‘Kankurur’ are large birds of prey native to Vland. They have a homing instinct and can carry up 20kg in their talons – making messages and small cargoes possible. 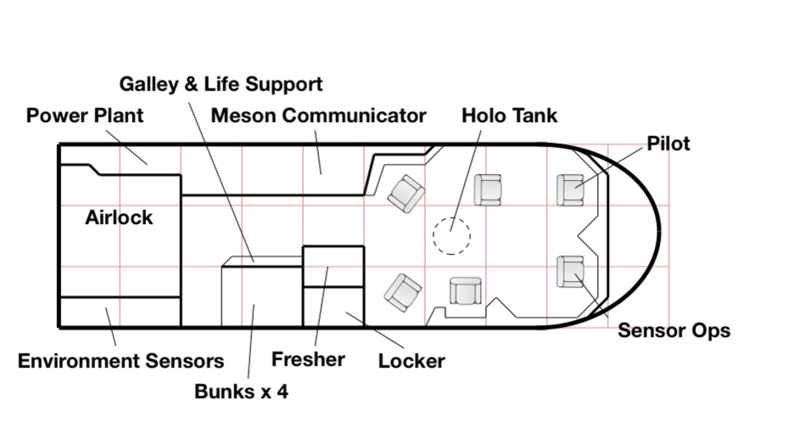 Features: Airlock (opens to rear and roof), TL13 Fusion still, Meson Communicator – 50,000km range, two Radios – 5000km range, galley, four berths, fresher, cruise control, six TL15 rescue balls. Dimensions: 15m x 4.5m x 3.75m. Jury-rigged repairs will stop functioning after 1-6 hours. Field repairs require a source of spare parts (scrapyard, a workshop, systems on another vehicle, or can be taken from other systems on the same vehicle (p.60 Core Rulebook)). For field repair, the task time frame may be increased by one or two increments.